Nine skins (3 styles in 3 colors) with a new plug-in (by TheGreenReaper) that allows alpha transparency to be adjusted for each window. Also includes UIS1 skins in each color. All WB4 features skinned. 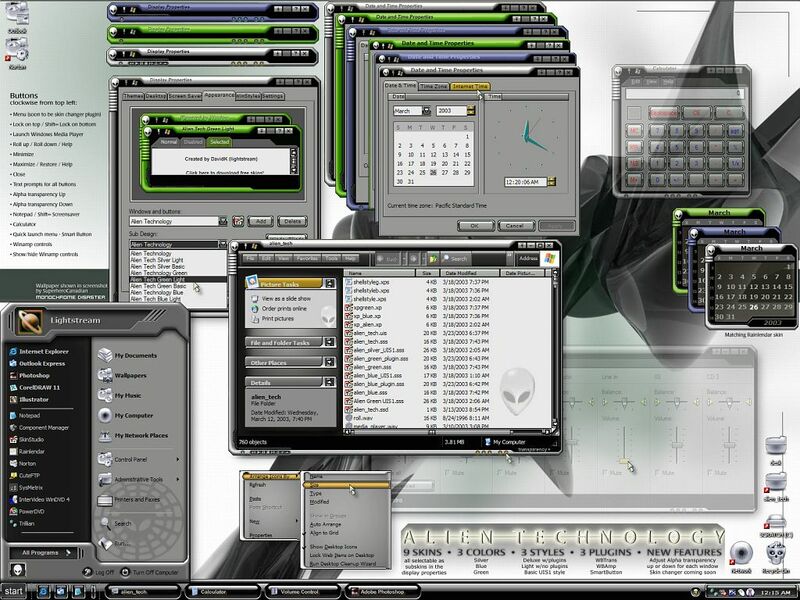 Smart Button, Winamp, Lock on top/Lock on bottom, WMP, Notepad, Calculator etc. Indexed color for speed, interface designed for everyday use and maximum readability. Text prompts for all buttons. This is awesome David. Best WB I've seen a while. And it's been too long since we got some Lightstream skins. Awesome, David! This is great! I love the start button! The Start menu is excellent. The titlebar is so simply done, but it's wonderful at the same time. The XP shell stuff is smooth. hey, great skin. what's that cool cursor set you got? Cool -- I've been twiddling with a skin to go with my Alienware Area 51 for a while, but now I can stop: I cant be this one! you really did a great work on this one. What else can be said LOL THANKS!!! Wow!! Fantastic.This one needs to be themed up.Icons/Systmetrix/Rainlander/.I needed a change and have been looking hard.Found it,,thanks for your efforts and sharing with us. Boy! that worth the wait! your skins are allways the most complete ones and your design also very original. This is what I call the perefect skin!